College life will have you showing your ID numerous times a day, almost as if your were a police officer with a badge! Ok, the experience might not be that cool, but you'll probably have to show your ID for all sorts of college functions, from going to the on-campus gym, to getting on the school shuttle, to even checking-in to your dorm. 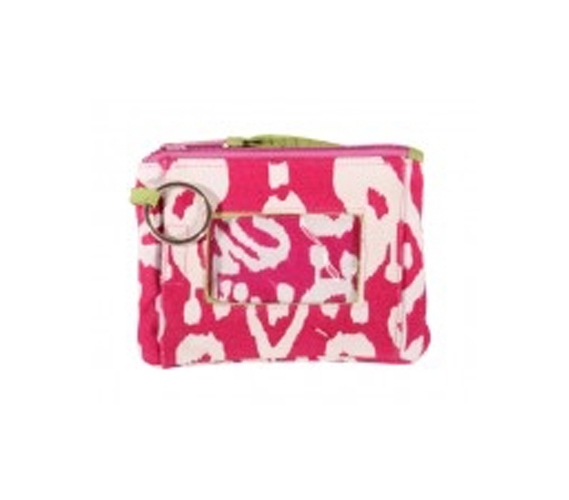 So instead of having to fumble it out of your wallet every time, add this Ikat Pink Student ID Case to your dorm stuff. This ID case for college students has a useful little plastic window up front to view your ID without having to remove it—it's just one more way to add a little convenience to college life. With its zippered pocket, you can use this cute ID case as a small wallet as well. From quick meals between classes to going to a nearby movie theater, keep your cash and credit cards organized because you'll be using them a lot in college. Too many students attempt to carry their IDs loose in a backpocket or thrown in some big, college backpack—those are the students who end up losing their IDs! With this cheap ID case for college, you'll keep that ID in your possession, right where it belongs.